Please select the size/dimensions of your cover. Please click on the image of where you would like the Tie Down Straps (with Child Safety Locks). These can be located One Per Side, on the Corners, The Front and Back, The Sides or No Straps. Strap locations, shown on images, are only approximate. You will be provided with new clips and screws. Please choose a vinyl top color by selecting one of the color images. NOTE:The colors shown here are intended as approximates and can vary depending on your display monitor. The actual colors will also vary slightly by dye lot, run or manufacture of material. The Foam Density is the strength of the foam. The denser the foam, the stronger and more durable it is. Denser foam should be selected if you want a more rigid and longer lasting cover. It is especially important in areas that have snow (2 lb density is recommended). The stronger the density, the less likely it is to prematurely bend, break or bow. A higher density is also recommended if you have children, pets or errant adults. A denser foam will also be less likely to get water absorption and will also provide better heat retention. Select your foam thickness/taper by clicking on an image. The standard cover comes with 4" x 2" tapered foam. This means it is 4" thick, in the middle, and tapers down to 2" on the edge. The taper allows for water and snow run off. The thicker the foam, the better the heat retention. The 5" x 3" taper foam will provide better heat retention and is like an extra blanket of insulation. The 6" x 4" taper foam offers the best heat retention an is like two extra blankets of insulation. Please select the Skirt Length option you would like. The skirt is what hangs down on the side of the cover. It is mostly aesthetic and should hang down long enough to cover the exposed shell of the spa. Measure the skirt length from the bottom of the foam down. Select Foam Plastic Wrap Option? Please select the core wrap option you would like. The polyethylene sheeting is wrapped around the foam core and inserted into the vinyl. This helps protect the foam core from water absorption. Double wrapping the foam core will increase the life of your spa cover by up to 20%. Double wrapping is two layers of polyethylene sheeting protection. *Do you need Cover Lifter Plate Package? If you have a Cover Lifter (Cover Cradle, Cover Cradle II, Uprite or Lift N Glide) that screws directly into the sides and/or back of your spa cover, you may require the Cover Lifter Plate Package. These are metal plates that are inserted into your cover so that you have something to screw the cover lifter in to. Otherwise, you will be screwing it directly into the foam and your cover lifter will not work. You will not need these plates if you have a cover lifter that has an arm that goes along the center hinge and your cover folds over. If you have any questions concerning this option, please contact us. Please check a box or boxes of any additional options you would like to add to your order. For a description of each item, place your cursor over the "tooltip icon" or "?". Descriptions of each of these options are also described in the "Features" tab that you can select from main menu on the top of your screen. This SPA COVER FOR CALDERA© HAWAIIAN HOT TUB has a template of 84 in. x 84 in. with 6 in. Radius Corners. Print out the “Corner Radius Template” to help determine the correct radius measurement. We recommend that you then take scissors and cut around the radius that appears to be closest to your existing cover’s corner radius. 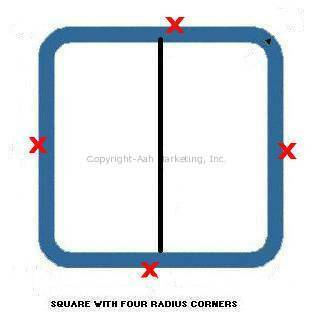 Then place the template on your existing cover till you find the radius that is closest. Please contact us at 1-856-437-0185 if you have any questions concerning measuring a radius. The cover has a flap around the edges of the spa called a skirt. The skirt must easily sit over the edges of the spa, with a little room to spare. You can also measure the skirt on your existing spa cover. The longest the skirt can be is 6 inches. You will want this to hang straight down. So, if the lip of the spa is at an angle, make sure you measure the cover long enough to achieve this. Also, measure the skirt long enough to cover the spa lip, or the spa cabinet rim. If you have any questions about this, please contact us at 1-856-437-0185. Hot Spring®, Caldera® are trademarks of Watkins Manufacturing Corporation which does not sponsor, authorize or endorse this site. This site, its contents, images and coding is copyrighted and is the property of CalderaSpaCover.net . Any copying, cloning or reproduction of any kind is prohibited.